Would you like to be awakened by the singing of the birds? 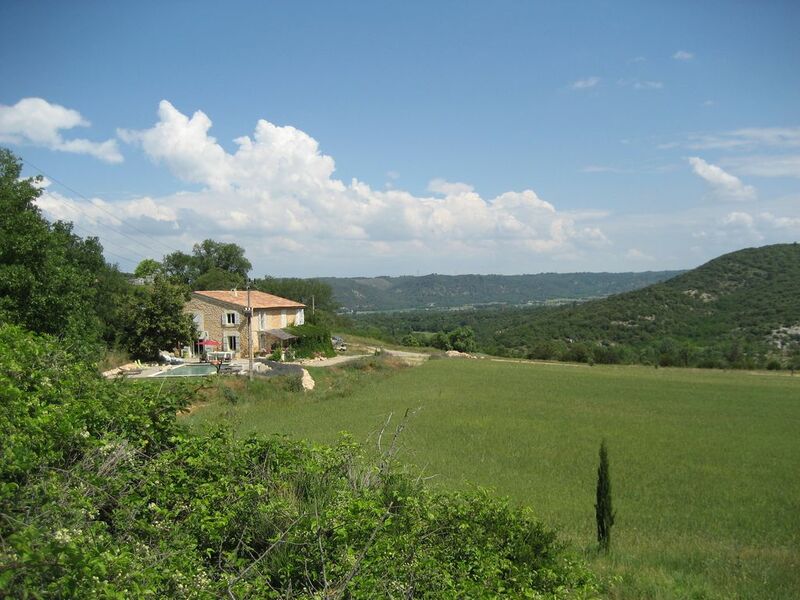 Our guesthouse is located 10 minutes from Vinon sur Verdon, 20 minutes from Manosque and 45 minutes from Aix en Provence. You are welcome to hike the varied area and enjoy the different views. The shade of big old oak trees gives you a quiet place to read or the right spot for a picnic. The nearest neighbors are 4 km away. The house has several terraces where you can retreat from the sun or tan. The former sheepfold is built entirely from the famous boulders of Provence. The stables are no longer part of this charming hideaway. On the ground floor there is an entrance hall with two separate toilets, a large kitchen (with owner), a dining room and a common living room (60 m²) with open fireplace, a bar and double doors leading to the terrace opposite the swimming pool. The saltwater swimming pool is 5 x 11 m in size and, with its overflow technology, lets you see the lavender growing in front of it. On the other side of the pool there is a beautiful lawn, on which a hundred year old oak tree, a lime tree and an olive tree provide shade and still find enough sunny spots. 200 sunny days a year, starry starry nights, good food with a nice glass of rosé give you a 'joie de vivre' that lasts for a long time. The hayloft has been converted into two apartments each with a small kitchen and a separate bedroom. There are also 3 two-person rooms, each with its own bathroom. The house has central heating for fresh days in spring and autumn. We also welcome your children, older than 17 years. Your children, older than 17 years are welcome. We've stayed over the Easter weekend in Andre and Helga's "Les Barraques" and we did enjoy it. The house is charming and the owners are very friendly and accommodating. Our 3-year old son enjoyed playing with the dogs and riding the buggy (and the tractors! ).